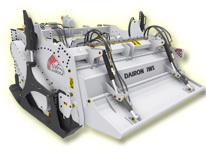 The public and road works range consists of the MS 200 L and MS 250 X machines. The RotaDairon® ground stabilizers MS 200 L & 250 X are designed to mix the binding agents (lime, cements,…) in order to stabilize the existing grounds. Designed to work on very clayey soils (green clay) or stone covered grounds, the RotaDairon® MS provides vertical and horizontal mixing beyond compare. Suitable for conventional tractors (200/280 HP, with crawling speeds), the RotaDairon® MS is especially designed for "small and medium sized works" (Industrial platforms, airports, bypass roads, parking lots, landfill sites, forest roads, approach roads,...). The RotaDairon® MS allows for better operation costs management (spare parts, energy consumption, maintenance) and the tractor doesn't necessarily have to be used solely on stabilization works, depending on the customer's needs. Over 40 types of ROTADAIRON ® machines await you in our landscaping range. ONE MACHINE, ONE PERSON, ONE RUN ™.